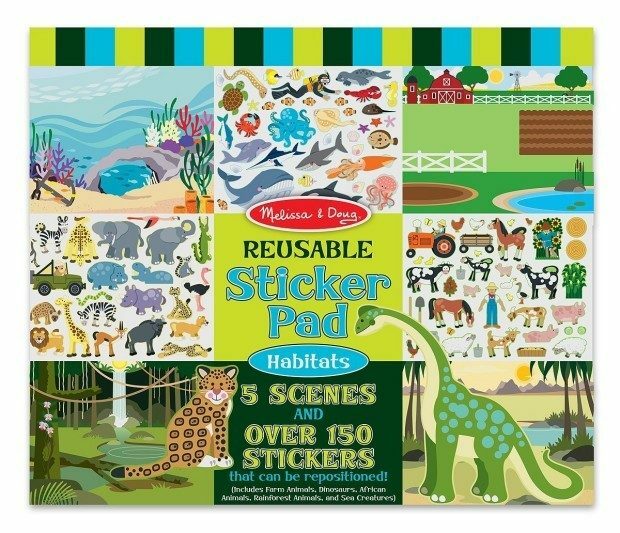 Melissa & Doug Habitats Reusable Sticker Pad Only $4.99 Plus FREE Shipping! You are here: Home / Great Deals / Amazon Deals / Melissa & Doug Habitats Reusable Sticker Pad Only $4.99 Plus FREE Shipping! Score! This Melissa & Doug item is only $4.99 and is not tagged as an add-on item and is shipping FREE! “Visit” a farm, a prehistoric landscape, an African oasis, a jungle or dive deep into the sea, all in your imagination. Over 150 reusable stickers of animals and people in different habitats to peel and position over and over. A great way to create beautiful images and spark opportunities for storytelling and conversation. The Melissa & Doug Habitats Reusable Sticker Pad is Only $4.99 Plus FREE Shipping!